I noticed fliped online/offline status in profiles in my lenguage. When im(user) Online it say im offline..
Odhlásený means offline not online. Its same as my brothers Czech lenguage (česky) where you got it correctly i tryed and it is correct there, online is Přihlášen and offline is Odhlášen. 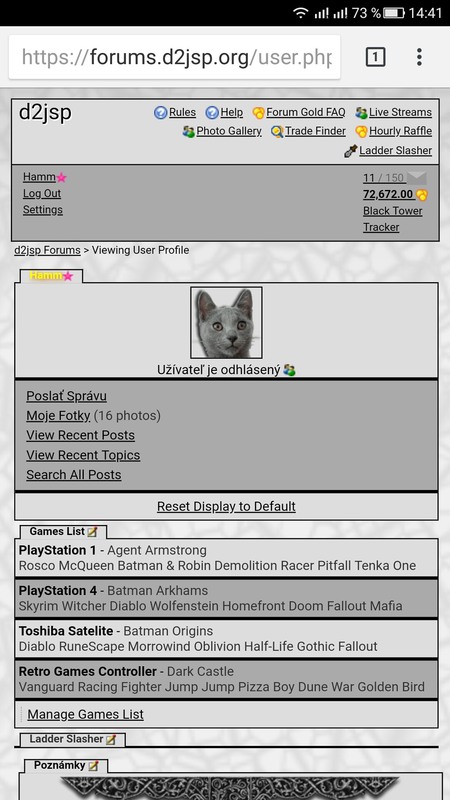 In screenshot you can see in Slovenčina im online icon, but its saying im Odhlásený - offline so its just Fliped. Thanks and Gl to fix this hehe! Your best bet would be to contact a mod or the web developer for further assistance. Unless a mod or som1 has already contacted you. I'm afraid you'll have to contact an admin directly anyway and ask for review. Admins gonna tell you whether this needs to be posted in site suggestions or it's gonna be implemeted right away as a bug fix. but yes looks like Kev and Paul has to fix this in the next site updates so i pmed him. This should be fixed, please confirm. much appreciated for all users with Slovenčina lenguage!